In the spirit of growth mindset, I have taken a risk and had to go through numerous iterations to put together a series of short screencasts on assessment. In doing so, I learned how to create a playlist in YouTube to group the assessment videos together for your convenience. If this task were an assessment…it likely would be considered a performance task for sure! Think about it…using the UbD model for developing a performance task we use the GRASPS acronym. Goal--provides a statement of the task. Establishes a goal, problem, challenge. Role–defines the role of the students in the task. Products/Performance–clarify what the students will create and why they will create it. 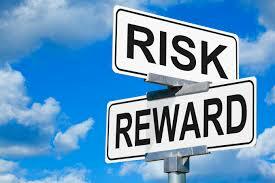 Take a moment to think about the types of performance tasks that are embedded within your own lives at home or work. 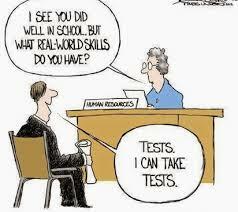 Think about when we design performance tasks for our students, are they grounded in the reality of today’s world? In most cases, teachers say they wanted to become a teacher because they love working with children and helping them learn or they say they love the content and helping students love it as well. It is in the in-between state between inspiring children and helping them learn content that assessments can actually play an extremely significant role. Assessments become powerful tools in student achievement when they are aligned, frequent, formative, and provide feedback about learning during the process of learning. 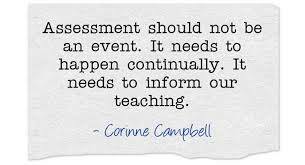 Assessments are also not one event that happens in time, but rather a variety of pieces of evidence that tell a story about our students’ progress in learning. 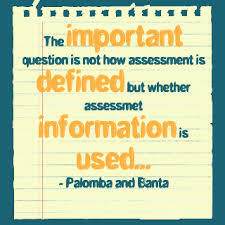 Assessments should be more like a scrapbook of learning, rather than a single snapshot of a moment. A unit could and should have a wide variety of assessments including self-assessments, peer assessments, formative assessments, performance assessments, constructed response assessments, or portfolios. Assessments are best developed, refined, and analyzed collaboratively to ensure consistency in standards of learning for our students. The development of common assessments will be key to our continued progress for improving student achievement and growth. Working collaboratively with peers will allow you to dive deeper into the standards, share strategies for differentiation, and provide data that can immediately support student learning. Developing common assessments pushes us to make stronger linkages between our targeted standards and tracking our students’ learning progress.